All-inclusive Belvedere Hotel is a famiy-friendly hotel just opposite a pebbly beach and overlooking the Ionian Sea, in Agios Ioannis. Featuring an outdoor saltwater pool, 24-hr reception, on-site restaurant and lobby bar the hotel welcomes guests for a comfortable stay with all modern amenities and warm hospitality. Immaculate, well-appointed guestrooms here come with private balconies with garden, mountain or sea views and come equipped with air conditioning, satellite TV and mini fridge. The pool is furnished with free sun beds and umbrellas has a pool bar and provides a home away from home for relaxing vacations. The hotel is situated in a scenic surrounding based on a hill overlooking the Ionian Sea, across the road from a small pebbly beach. Agios Ioannis enjoys the reputation of being the most beautiful beach on Corfu’s south-west coast. The beach is blessed with crystalline blue waters and soft sand and great views. The island of Delos in all its scenic beauty can be seen from the coast. The beach is far away from the crowded tourist areas and best for those who wish to enjoy privacy at a smallish beach. 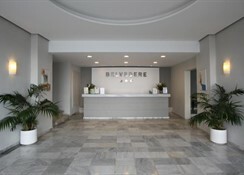 Hotel Belvedere is 3 km south from Benitses village facing the Ionian Sea. It is across the road from a small pebbly beach. Achilleion Palace is 4.7km from the property while the Messonghi Beach 5.3km. The Corfu Airport is roughly 15 km away from the hotel. 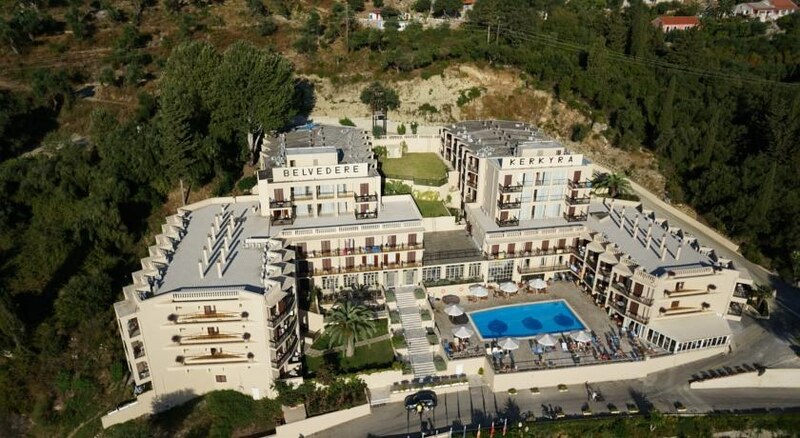 The Belvedere Hotel has 170 well-furnished rooms in its main building overlooking the Ionian Sea and offers Comfort Twin bedded, Standard Twin bedded and Superior Twin bedded rooms. 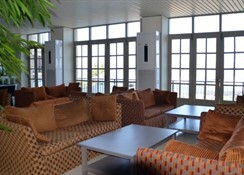 The rooms have balconies which offer amazing views of the sea and surroundings. The rooms come equipped with A/C, two single adult beds, Satellite TV, mini refrigerator and private bathroom (shower). The hotel has an all-inclusive package where guests are offered all major meals, beverages and liquors during select times at select outlets. There is a Main Restaurant offering a sumptuous breakfast and dinner buffet style of delicious Greek and International dishes. Expert chefs prepare delicious dishes from the freshest of ingredients. 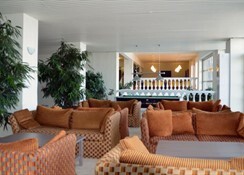 The Main Bar is lobby serves soft drinks, juices, local alcoholic beverages and cocktails. 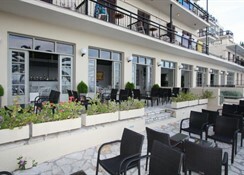 The pool bar serves fresh coffee and tea, ice cream, soft drinks, juices, local alcoholic beverages and light bites. The Belvedere Hotel has a swimming pool and kids’ pool and terrace where guests can soak up all the sun besides easy access to the beach. The hotel has facilities Billiards. There is lively evening entertainment too. 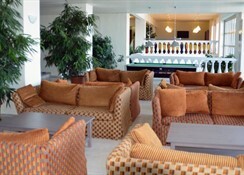 There is a shared lounge and TV area broadcasting popular shows and sports. 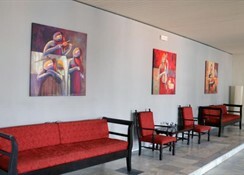 There is a helpful concierge services and a lovely snack bar and bar where guests can relax amidst a laidback ambience.